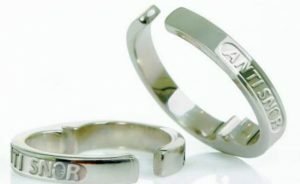 What Is the AntiSnor Acupressure Ring? If you are one of those people who have searched far and wide for a solution for their snoring, one that would be both affordable and effective, as well as convenient and comfortable, then you should definitely take a look at our AntiSnor Acupressure Ring review. AntiSnor is a unique snoring aid on the market, one that does not work by physically regulating the way we breathe during sleep. Instead, it uses the natural flow of what the ancient Chinese called “chi” – or life energy, regulating and balancing this energy so that the entire body benefits from it. This ring is based on acupuncture – or more correctly, on acupressure. The ancient Chinese believed that the energy that flows through the body uses a special path through our fingers. The little finger has some acupressure points that are associated with sleep, insomnia, and snoring, as well as with migraines and sinus problems. The inside of the ring features a little ball or lump, which stimulates the right acupressure points when you wear the ring on your finger, resulting in much better sleep at night. Unlike most other snoring aids, the AntiSnor does not cause any side effects that are generally associated with snoring devices like mouthpieces, tongue retainers, chin straps, etc. This means there is no drooling, dry mouth, sore teeth and jaw, misalignment, mandibular pain, sweating, itching, allergies, and so on. This anti-snoring ring is very light and comfortable, which is another thing that sets it apart from other devices. Some people hesitate to start using a snoring aid because they fear it will make them uncomfortable and keep them from falling asleep, but you don’t have that kind of problem with this ring. It’s a simple ring for your finger, which you can adjust to fit you perfectly, so don’t be surprised if you forget to take it off in the morning. It’s really that comfortable. Plus, it looks quite nice. As we already said in this AntiSnor Acupressure Ring review, it is extremely easy to use. When you place an order for this ring, you get to specify your ring size (there is a choice between small, medium, and large). If you pick too small a ring, it will feel too tight and uncomfortable. Similarly, if you pick a ring that is too big, it will probably slip off your finger during the night. Don’t worry if your ring size doesn’t fall exactly into one of the three offered sizes because there is a small gap that you can squeeze or stretch for a perfect fit. Even though it is not hypoallergenic, it does not cause any skin issues and it does not leave a stain. For optimal results, put the ring on at least 30 minutes before going to bed. You don’t need to wear it all the time, just during sleep, but some people actually like wearing it throughout the day. Also, some users have found that wearing two rings at the same time, one on each little finger, has an even better effect, especially in heavy snorers. The packaging contains one AntiSnor ring and a convenient little case to hold it when you are not wearing it. The price is $22, which is slightly more expensive than some other anti-snore rings on the market but still cheaper than most mouth guards. If you are still unsure if AntiSnor Acupressure Ring is right for you, check out the key advantages and flaws of this snoring aid. AntiSnor is a nice little snoring aid that seems to be helping a lot of people solve their snoring problems. It’s easy to use and it does not have any side effects, which makes it one of the best snoring aids out there right now. While researching for this AntiSnor Acupressure Ring Review, we’ve discovered that it performs best when used by mild to moderate snorers. Bear in mind, it will not solve sleep apnea. Our ratings are the result of an objective and independent evaluation of AntiSnor Acupressure Ring, generating the final rating that reflects the overall quality of the company. Ratings may change as the product introduces changes. AntiSnor Acupressure Ring user rating based on 5 user reviews. I was sooo surprised when it worked to my husband. At 1st night, no snoring at all! But on the 4th night, he’s snoring again and on the 5th night, he’s not. So I’m confused now.. maybe the ring only works when its worn properly, i dont know.. i just hope that the ring will work for good or else, goodluck to me!? I give this ring two stars because it looks really fancy. Other than that, it definitely didn't work for me and didn't affect my snoring problem whatsoever. I bought two of these, one for my husband and the other for my daughter's boyfriend. Honestly, I can't really tell if it works or not. My daughter says her boyfriend stopped sounding like a freight train, but I don't see any improvements when it comes to my husband. So, I guess you can call it hit and miss product, it'll work for somebody and be completely useless for somebody else. These rings are actually quite elegant. They go well with my wedding band. I wear two because I feel like just one doesn’t do it for me. Antisnor acupressure ring is a very useful little thing. I have tried a lot of snoring aids and this is the only one that I actually forget I’m wearing. The only problem is, sometimes I lose it in my bedsheets because it easily slips off. 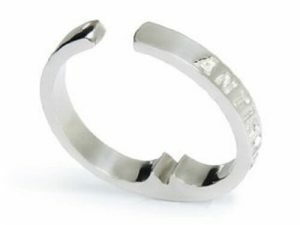 We found 0 verified AntiSnor Acupressure Ring discounts for April, 2019. There are no AntiSnor Acupressure Ring coupons or discounts right now. In order to be sure that AntiSnor Acupressure Ring truly is the best solution for your snoring troubles, you need to know what makes it superior or inferior to its alternatives. Discover how AntiSnor Acupressure Ring compares to other popular snoring aids of its kind with our detailed feature and price comparisons and easily determine whether you are making the right choice.